Kaija Saariaho's new work Mirage (2007) for soprano, cello and orchestra received its much-anticipated world première on March 13, 2008 at a sold-out Salle Pleyel in Paris. 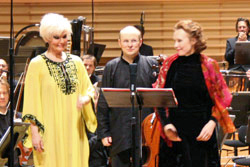 Star soprano Karita Mattila and cellist Anssi Karttunen, the two dedicatees with whom Saariaho closely collaborated during the composition, performed the 15-minute piece with the Orchestre de Paris under its Music Director Christoph Eschenbach. Mirage is the musical setting of a short poem by the Mexican shaman and Mazatec healer María Sabina (1896-1985); it adds to a long list of expressive vocal compositions by Saariaho, including the recent oratorio La Passion de Simone (2006), the opera Adriana Mater (2006), or the song cycle Quatre instants (2002). As a tribute to the great Finnish composer (who has made her home in Paris since 1982), the concert also featured Orion (2002) for orchestra and Notes on Light (2006) for cello and orchestra. Following Kaija Saariaho's intention, Mirage was given twice throughout the evening, framing a programme that was greeted by the audience with standing ovations. The all-Saariaho concert was recorded by Radio France for a CD release by Ondine in autumn 2008. The concert was officially announced as the opening to "100% Finlande en France", a spring festival run in Paris and across France under the auspices of the French Ministry of Foreign Affairs, displaying Finnish culture in its various forms and featuring nearly 500 artists in more than 250 events.